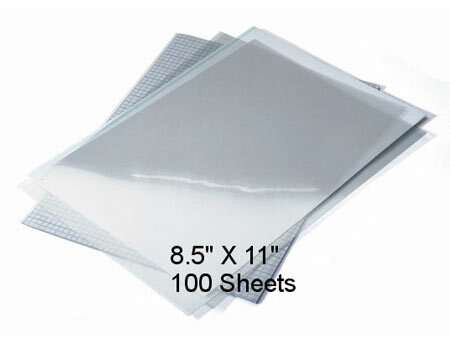 This high grade inkjet film material makes it easy to produce film positives quickly and accurately. No need for a dark room or expensive camera! The key is using our Armur Inks in combination with our film. Armur Inks contain UV blocking agents to allow film positives to be burned to screens and this is not found in OEM inks. Be aware you cannot us just any brand of ink. See below for available Epson printers that use Armur Inks. As an added bonus you'll be able to produce digital inkjet heat transfers with the same Armur Ink print system. All you'll need is our InkJet Heat Transfer Paper and you're ready to produce commercial grade digital transfers! Don't turn down those highly profitable short run full color jobs. The Armur Ink system is great for textile orders such as shirts, mouse pads, tote bags and more! Note: You cannot us just any brand ink. Inks that are included from companies like Epson (and others) are not engineered for the purpose of printing on film. Our Black Armur Ink contains UV blocking agents to allow film positives to be burned to screens and this is not found in OEM inks. Although only black is required to produce positive film you will still need all colors for the printer to work. If your using a RIP you may be able to select just the black channel to print. In the Photoshop print driver control panel there is a setting to select called "separations". This setting will instruct the printer to print black or half tones (if applicable for multi color/process images). In "print preview" select "output" and select "half tones" and make further setting selections as needed. Using RIP software allows for controlling individual channels to output the specific halftones needed in order to print film positives. The benefit of using a RIP; It's faster and produces high quality half tones. Take a look at RIP's from companies such Multi RIP, Wasatch or Color Burst. Select 8.5" x 11" or 11"x17" after you enter QTY to cart.